Asabell is a top 40 B2B agency which specialises in improving its clients’ performance through sales briefings, sales toolkits and customer engagement using digital, print and events channels. The company’s clients include BP, BT, British Gas, Compass Group, Logica, O2, Plantronics and Three. The company had identified a common problem within its customer base: The central marketing team often found it difficult to ensure that all members of the sales team were using the correct sales presentation materials. Further research by the company highlighted other associated problems: sales people often wasted time customising presentations, and sometimes used out-of-date information. To solve this problem, asabell required a system for managing the information and data that was available for sales and marketing presentations. Specifically, the company wanted a system which would allow its marketing team to upload and maintain the latest PowerPoint presentations, and which their sales team could quickly combine with other PPTs and customise to create a targeted presentation for customers. Blueberry developed the ‘Preasy’ Web-based PowerPoint presentation system in line with the brief outlined by asabell. The system was built on the Microsoft technology platform, using IIS / ASP.NET and SQL Server 2008. 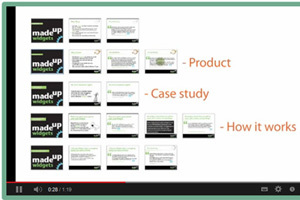 The system uses existing content to create a library of mini presentations called modules. Each time a new module is uploaded to the secure website it is tagged with a title and a description, allowing the sales team to search these fields to quickly locate presentations. Permissions can also be set for who can access the new material. The system includes a personalisation feature which allows a Title, Date, Customer Name, User Name and client logo to be substituted into the presentation. The system allows the marketing team to upload and maintain the latest PowerPoint presentations. When a member of the sales team logs into Preasy, he or she can choose which modules are required, the order in which the modules should run, and use the personalisation feature before downloading the file as a tailored, branded presentation to their PC in either PowerPoint or PDF format. The process takes less than 2 minutes. If a module is subsequently changed by an author, the users of the module receive an automated email notifying them that an update is available for their presentation, so ensuring the sales team are always using the latest materials. The Preasy system is perfect for sales people visiting customers; a trainer developing a course; or anyone else who uses PowerPoint presentations.